This week, I’m foregoing all other blogs to concentrate on the 10 year anniversary of the landing of Hurricane Katrina. During my employment with The Aspen Times, reporter Scott Condon and I were sent to the ravaged town of Pearlington, Miss., to document the damage and what the town needed to recover. The evening before Hurricane Katrina hit on Monday August 29, 2005, I was talking with our night editor Chad Abraham at The Aspen (Colo.) Times. He wanted to put an Associated Press story on the front page about the predicted damage for the area. He was worried because there was no local angle or connection. Within hours of Katrina hitting the coast, it became clear that this would be the biggest news story to come out of the US that year and for some time. 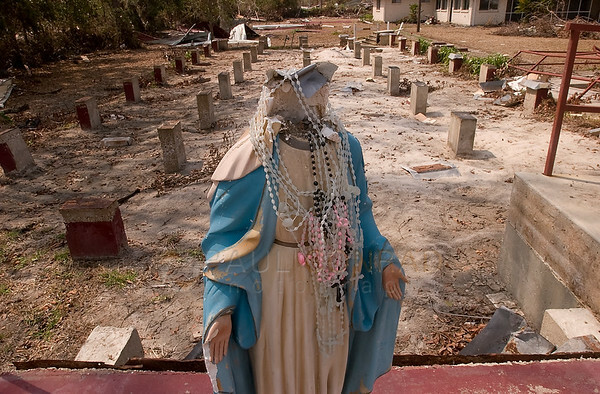 © Paul Conrad/The Aspen Times – Rosaries flow from a headless Virgin Mary on what was once the steps leading to St. Joseph’s Catholic Church in Pearlington, Miss., one month after Hurricane Katrina roared ashore with a devastating storm surge. The church was lifted off its foundation, moved nearly a hundred yards down the road and gently placed as the surge subsided.The church was destroyed when rescue workers cleared a path for equipment. After almost 3 weeks of reading and watching how the federal, state, and local governments were overwhelmed with the task of rescues, helping survivors, and beginning the process of cleaning up. Clearly, the system was failing. 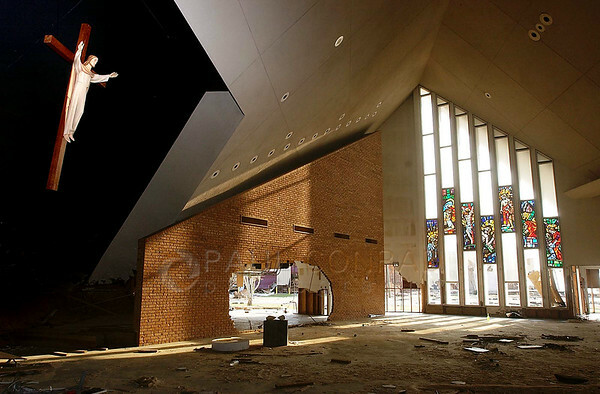 © Paul Conrad/The Aspen Times – A crucifix watches over the remains of St. Paul’s Catholic Church in Pass Christian, Miss., on month after Hurricane Katrina roared through the region. The stained glass windows of the Apostles remained intact while the others shattered from the wind. The pews and marble altar were never found. The valley I lived in has a big heart and many people were donating to various charities but we were also finding out, many relief trucks were being stopped short, donated goods were dropped off at random places where they began rotting in the heat and humidity, or they just were not getting to the area for other reasons. 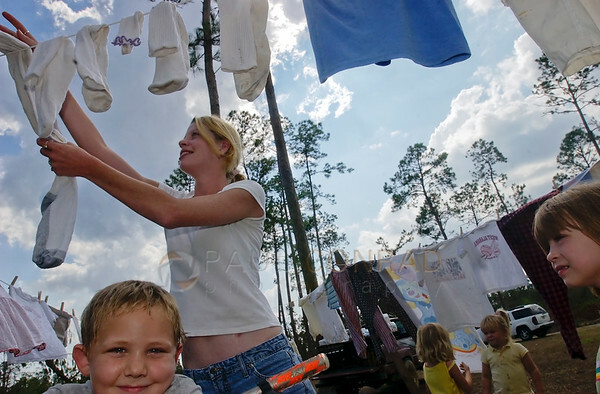 © Paul Conrad/The Aspen Times – Hilary Furey hangs her clothes in a makeshift laundry room outside her Pearlington, Miss., home a month after Hurricane Katrina flooded the town with its storm surge. Through a concerted effort from officials in the town of Carbondale, Colo., the unincorporated city of Pearlington, Miss., was adopted. Relief efforts and supplies were to go to the storm ravaged town. Pearlington was nearly wiped off the map. As a result, Scott and I flew to Pearlington a month after Katrina to put a face to all the relief efforts, find out what the immediate needs of the people are, and what they need to rebuild. We traveled there 3 times: one month after, six months after, and then 14 months after. 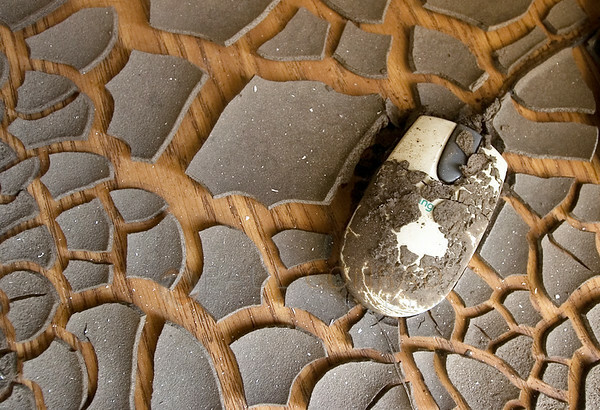 © Paul Conrad/The Aspen Times – Untouched for six months after Hurricane Katrina flooded the classroom, dried and cracked mud surrounds a computer mouse at Charles B. Murphy Elementary School in Pearlington, Miss. Today, I’m just posting a few images as a primer to my next 3 blog posts covering such a devastating damage and the people who endured. Please continue to follow my blog for updates as I post them this week honoring those who’ve endured 10 Years After Katrina. In Part 2, I’ll cover how visually exhausting it was to see all the damage and how I overcame the desire to shoot everything so I can focus on those in need. 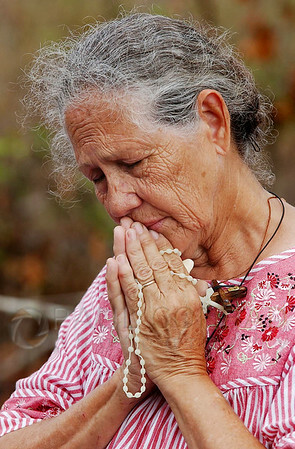 © Paul Conrad/The Aspen Times – Ana Weidie of Pearlington, Miss., prays during Sunday morning mass at St. Joseph’s Catholic Church in Pearlington.